Over 3 lakh children, under the age of five, die due to diarrhoea and water borne diseases. This is not a phenomenon seen only in remote villages, but in our cities as well. Around 41 million people defecate in the open in urban India. New Delhi: A few years back, with the launch of Mangalyaan, India joined an elite group of nations with a successful mission to Mars. Ironically, just a few months later, India also launched the ‘Swachh Bharat Mission’ to rid the country of the problem of open defecation. 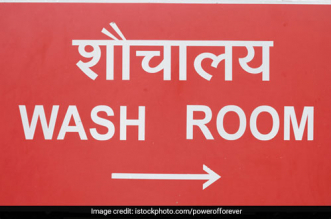 Therein lies the country’s greatest paradox – despite being a rising global power, more than 600 million Indians don’t have access to a toilet and defecate in the open. 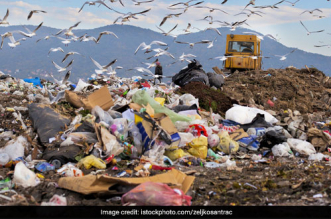 A recent sanitation report by WaterAid, says this problem is so big that the daily waste produced on the streets of India’s towns and cities was enough to fill eight Olympic-sized swimming pools, or 16 jumbo jets with poo every day. Did you know that a single gram of human waste can contain up to 10 million viruses, 1 million bacteria and 100 parasite eggs? If there’s an easy access to toilets everywhere in India, it will mean lesser diarrheal diseases which kill nearly 1,000 Indian children each day. According to the ‘true cost of poor sanitation’ lack of access to sanitation cost the global economy US$222.9 billion in 2015, up from US$182.5 billion in 2010, a rise of 22% . So how can India solve this huge glaring problem? Here’s the list of 5 innovative models that India can adopt. 1. Solar Powered Urine Diversion (SPUD) Toilets from Africa: 100% waterless and chemical-free, this toilet model is not only affordable but also user-friendly and can be easily installed in rural parts of India. Moreover, this model is low maintenance, saves water and is one of the most advanced composting toilets in the world. This toilet comes attached with a solar powered fan which dries the human waste and excreta instead of flushing it out the conventional way. The fan runs continuously for 24 hours so it can dry the excreta completely. Once the excreta is dried, it can be put into a bucket where it will eventually become manure. Just before you get too worried about the high electricity cost of running the fan for 24 hours, remember that this toilet is solar powered and generates its own electricity. 2. 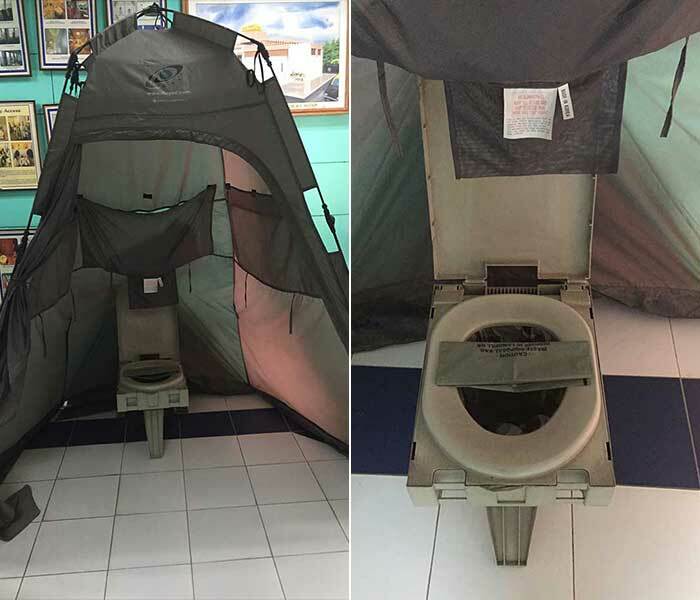 Portable Tent Toilets: It’s an earth friendly, convenient and portable solution to combat the problem of open defecation in slums. Not just that, this toilet helps in saving water too. The waste is collected in a biodegradable bag that contains ‘ChemiSan,’ a material that helps to deodorize and decompose the waste. Not only that, this chemical also reduces dangerous pathogens in human waste. These bags can be easily decomposed or buried around the toilets by digging a small pit. 3. 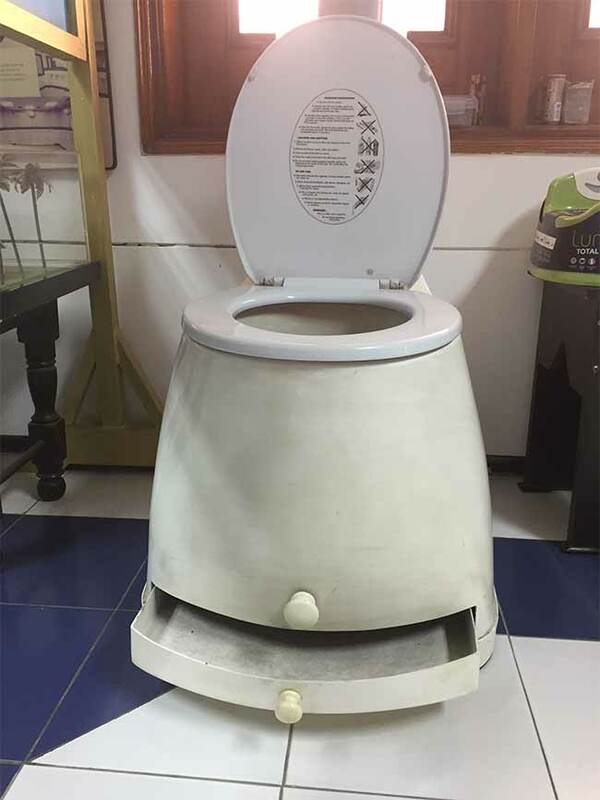 Dr Bhindeshwar Pathak’s Eco-friendly Two Pit, Pour-Flush Compost Toilet: The working model of this toilet is very simple. 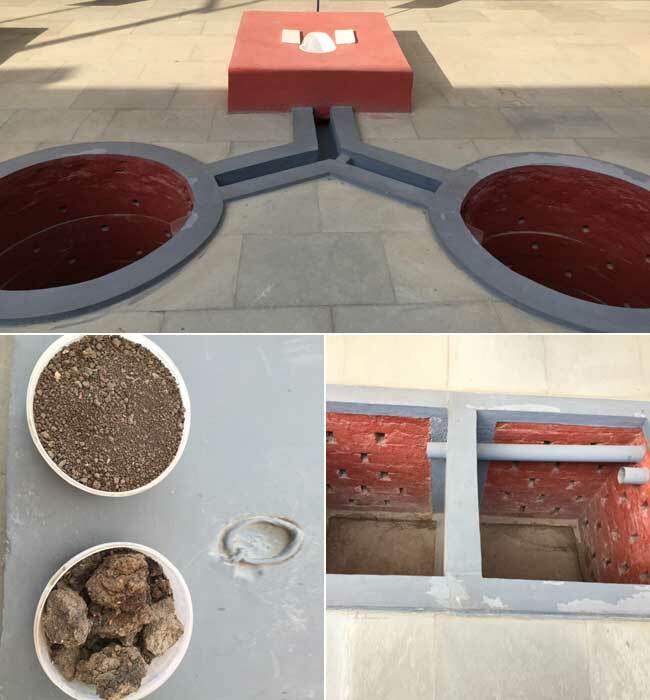 Two pit holes are created around the toilet, one of which is functional while the other is kept closed until the opened pit is fully filled with human waste. So why are there two pits at the first place? The filled pit is then closed for composting, and the waste collected in that pit is converted to bio fertilizers. What’s great is that the fertilizers made this way are high in nitrogen and phosphorous, two chemicals that help with better irrigation. Dr Pathak installed these toilets in individual households as an alternative to the comparatively extensive sewerage septic tank based systems. 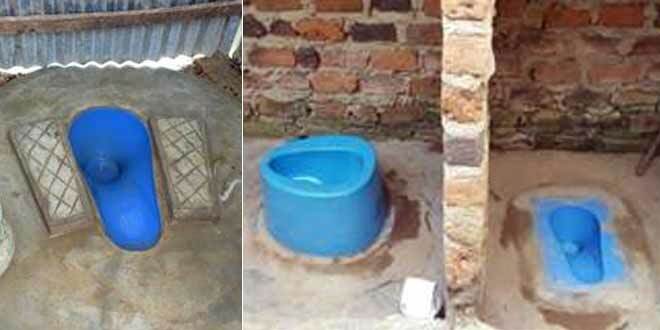 This toilet technology has also been recommended as a Best Global practice by the UN. 4. LIXIL’s SaTo (Safe Toilet) Pan: The SaTo pan (pronounced SAH-toh) is a cheap innovation designed for poor households and is supported by the Melinda and Bill Gates Foundation. The SaTo pan model uses a simple trap door design that forms a water seal at the bottom of a pan set into a cement slab over the pit. The water seal reduces transmission of disease by insects, reduces odor and reduces the volume of water needed to flush. Each product in the SATO series is designed to suit the needs and preferences of users in different areas. Certain models are tailored for areas where concrete is not widely used in the construction of toilets, while another is intended for places where a seat is culturally preferred to a squat toilet. More than 1 million units are already in use around the world, benefitting about 5 million people through their simple yet powerful designs. 5. Garv Stainless Steel Public Toilet Infrastructure: Indestructible and smart – Mayank Midha’s stainless steel smart toilet launched in September 2016 is a comprehensive and sustainable solution to end open defecation in rural India. 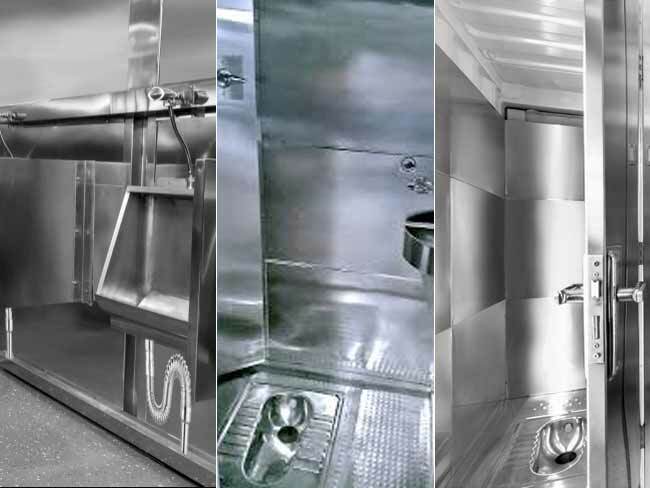 This model uses stainless steel for the superstructure, toilet pan, and washbasin, making the units vandal-proof, rust-proof and easy to clean. This means a higher shelf-life with lower operating costs. GARV toilets have been piloted in semi-urban areas in Faridabad for now. Though this toilet has six models catering to different needs. For instance, “Toilets for her” Include a sanitary pad vending machine with sanitary pad incinerators. Another model, suited for areas without sewerage connections, is equipped with bio-digesters, that process the faecal matter through bacterial action. The only output is an odourless, colourless liquid that can be used as a pesticide spray later. “Till now, 95% of our installations are without smart-technology. Government bodies and CSR arms, even of the biggest corporates are skeptical about using high-technology in sanitation and do not want to financially commit to this risky business. We have by-passed this route of direct engagement and proposed public-private-partnership mode to Urban Local bodies for implementation of these smart toilets in cities, urban slums and other underserved areas. Through this business model we have been able to finalise contracts in 2 cities of Haryana and by mid-2017, we will have 120 sites with Smart Toilet Blocks which will have facilities for men, women and differently-abled citizens,” says Mayank Midha speaking with NDTV at the World Toilet Summit 2016. 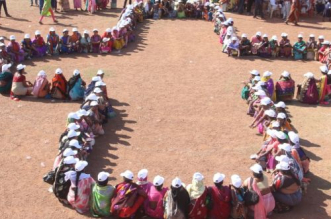 Every Indian village has earmarked regions for defecation separate for men and women. About 2000 people leave in it. The solar reaction diffusers the human waste. It’s very hot son in India in General. Whereas toilets we see are filthy and one can’t approach it also. So present system is ok. Only bigger villages may go for SATO PAN. OTHERWISE I FEEL THAT BRORES OF RS. WILL BE WASTED IN LAVOTARIES WHICH WILL NEVER BE USED BY VILLAGERS. ONLY THE CONSRUCTORS WILL ENJOY. Hi Suhas, I am a 73 year old Indian from Kerala I have lived in three different villages in Kerala; there were no earmarked regions for open defecation in any of them. And reports and photos from various parts of India show there is no such systematic arrangements for open defecation in most of the villages. I haven’t read about such a system. And even if there is, it is still not good as it does not prevent all the problems that are caused by open defecation. Government of kerala about 45 years back, when Human collection of human waste was abolished,which ended the open toilets(DRY LAVATORIES ). 20 percent of world popyulation lives with no MODERN TOILETS! There is need, no doubt.For that second half of the article is sufficient! Speaking about excreta, any guesses people what Mr. Imran Khan eats to make such stupid comments? Why?? Don’t you go to toilet everyday?? Your excreta is automatically evaporated from your skin?? You baffoon!! Go die somewhere!! Dear Imran, People like you are obviously a disguise to our community. Was there a need to invoke religion here? we are discussion hygiene. Remember if you disrespect other religion, others will disrespect your. In turn you yourself are the cause for any disrespect to your own religion. It is not in your hand. Its not about Hindus or Muslims, its about being hygene and how to make use of human waste, as for Cow Dung, it has anti septic properties and regardless of religion people in Indian subcontinent (Even in your Pakistan) use them. So please keep your religious intolerance views to your narrow minded self.